On this date in 1940 Adolf Hitler wrote a letter to Gen. Fran­cisco Franco, the Cau­dillo of Spain, asking for naval bases for Ger­many in the Spanish Canary Islands and other places. Franco replied one week later, demanding enor­mous stock­piles of wea­pons, supplies, and part of French North Africa as com­pen­sa­tion. Caving into Franco’s demands would have been dis­astrous for Ger­many’s rela­tion­ship with Vichy, its new French vas­sal, as well as giving the Royal Navy an ex­cuse to occupy the poorly defended Canary Islands. Besides, Hitler believed he could find a way to bring Spain into a relation­ship with the Axis that would force British Prime Minis­ter Winston Chur­chill into nego­ti­a­tions aimed at restoring peace between Great Brit­ain and Nazi Ger­many. If that didn’t work, Hitler had the Gibral­tar card up his sleeve. The stra­tegic Brit­ish en­clave on the south­ern tip of the Ibe­rian Penin­sula rankled Franco and Hitler knew it. Two months earlier he had send a team of Ger­man officers headed by Adm. Wil­helm Canaris, who in the 1930s had set up a Ger­man spy ring in Spain, to find a way where­by the two states could co­oper­ate in expelling the British from their rock for­tress and close the Medi­ter­ra­nean to the Royal Navy. Canaris’ team deter­mined that Gibral­tar might fall to an air-supported ground attack by at least 3 Ger­man engi­neer ba­ttalions, 2 in­fan­try, and 12 artil­lery regi­ments. 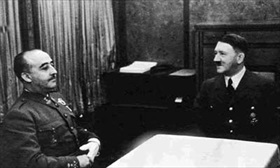 The Fuehrer played the Gibral­tar card the next month in a face-to-face meeting on the Spanish-French bor­der at Hen­daye. With Madrid’s approval, special Ger­man units would storm the rock on Janu­ary 10, 1941, and deliver it to its right­ful owners. Franco was already getting cold feet over Gibral­tar thanks largely to Canaris, who painted a grisly pic­ture of what could go wrong in a hos­tile Spanish take­over of the British-held penin­sula: the British could seize the Cana­ries and also attack the Spanish main­land. 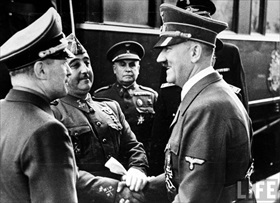 Knowing its ab­surdity, Franco told Hitler that Spanish, not Ger­man, troops must carry out the his­toric mis­sion. Again Franco appealed to Hitler’s gen­er­os­ity to supply his army with all the mate­riel, food, and bo­rder con­ces­sions to grease the mis­sion. Added to these con­cerns was finding the where­withal required to re­build his coun­try fol­lowing the Spanish Civil War (1936–1939). It was all too much for Hitler to swallow, and he left empty-handed. 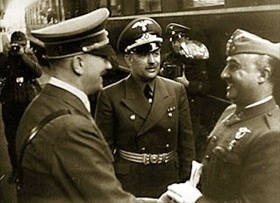 Left: Hitler and Gen. Francisco Franco at Hen­daye rail­way sta­tion, Octo­ber 23, 1940, the only meeting between the two dic­ta­tors. Months earlier, on June 10, 1940, the day Italy declared war on France and Great Brit­ain, Franco hinted of his inter­est in joining fellow fascist Benito Musso­lini in the war. Though Franco sympa­thized with the Axis powers through­out the Euro­pean con­flict, he nudged his country into staying mostly neu­tral. Never­the­less, in August 1941 he sent some 45,000 volun­teers (the “Blue Division,” or División Azul) to fight along­side other Axis nations on the Soviet front. Franco also opened his ports to Ger­man U-boats and in­vaded the inter­na­tionally adminis­tered city of Tan­gier in Morocco after the fall of France in 1940. Right: Gen. Franco (1892–1975) ruled over Spain from 1939 until his death on Novem­ber 20, 1975. Hitler’s visit to Franco and Hen­daye took him through Mon­toire, France, where he con­ferred with Vichy Prime Minis­ter Pierre Laval. The Nazi colla­bo­rator arranged for a meeting between him­self, Hitler, and Vichy Head of State Marshal Philippe Pétain at Mon­toire on Hitler’s return trip on October 24, 1940. Left: Prior to entering bilateral discus­sions on Octo­ber 23, 1940, Hitler and Franco reviewed German troops at the rail­way station at Hen­daye, the Ger­man-occupied French Pyre­nees town that bordered Spain. 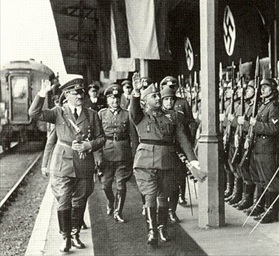 Right: Franco and Hitler confer in the Fuehrer’s Sonder­zug (private train) in Hen­daye’s rail­way sta­tion. According to Franco’s daughter, her father was worried about the Ger­mans pos­sibly kid­napping him and forcing him to take Spain into the war on the Axis side. Franco sup­posedly appointed a senior gene­ral and two others to assume con­trol of the coun­try in the event he was detained. Through­out his dis­cus­sions with Hitler, Franco toed the line Adm. Wil­helm Cana­ris, Hitler’s Ab­wehr spy chief who played a double game, had advised him to take; namely, for­bid the pas­sage of Ger­man troops through Spain for the pur­pose of cap­turing the Brit­ish depen­dency of Gibral­tar lest it un­leash devas­tating reper­cussions for Spain and her Atlantic possessions.